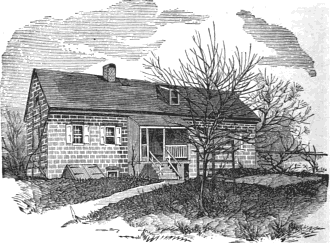 Moravians started a community in Bethlehem, Pa. in 1741. The members gathered several times a day to eat: breakfast at 6, "the piece" or mid-morning lunch/snack at 9, dinner at noon, vespers at 2, and supper at 6. In 1906 Pennsylvania "the piece" was still kept and reluctantly allowed in the coal mines. 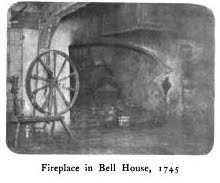 "The old bell of the Bell House used to call the Moravians together for meals. The breakfast hour was six, and the meal consisted of coffee, bread and butter, and molasses. At nine o’clock came "the piece,” as the mid-morning lunch is still called in Pennsylvania, a German custom that the grasping mining companies have long sought to crush out, since it takes the men and boys away from work for fifteen minutes. The right, however, has lately been reluctantly acknowledged by the coal companies. The early Moravian “piece” was home-brewed beer and “Moravian cake," - a fancy bread. In later years, in some homes. it consisted of cold meat, pie, and bread and butter. The bell sounded a little before twelve for dinner. At two came “vespers,” which was a repast of coffee, bread and butter. Often the “Moravian cake” was served at “vespers.” The Moravian vesper meal is the equivalent of the English five o’clock tea. If company was asked, then smoked beef and preserves might be added. At six o’clock came supper. In families that could live “full and plenty" - say those who have recorded the ways of former generations, they baked bread in large quantities every Saturday, also cakes and pies. Then, too, doughnuts, or Fastnacht cakes, as they are called, were fried, and crullers. Cake and wine were passed at weddings. Vineyards, in German fashion, were not productive, and the wine industry was early seen to be unsuited to the locality. The “Moravian cake” is a delicate risen bread, made with a potato sponge with some shortening, like a fine roll or bun. When twice risen, it is made into a large sheet of medium thickness, and placed in a baking—sheet. Then deep finger impressions are made over the surface at regular intervals. Melted butter is poured on freely, and light brown sugar with a little cinnamon is spread over, thicker than frosting. The sugar and butter do not candy, like “cinnamon bun,” which is rolled, but the sugar remains rather dry and crumbly. The demand for this novel bread is very great. It is made for special meals, like Sunday night supper, throughout the year in all homes. Similar bread is used for the “Love Feasts” at the church, only no sweetening is used, the flat buns being without butter or sugar. These, with coffee, are passed during certain week-day services in the church known as "Love Feasts.” The officiating minister takes his repast from a mahogany table before the high pulpit, which is very like the pulpits with side stairs still to be seen in New England churches. Indeed, the plan of the church with doors for the congregation to enter are much like the old church in Worcester where Bancroft, the father of the famous historian, used to preach. Apple and plum orchards thrived, and the fruit was prepared for market by the Sisters in the little cottage here shown, called the Schnitz House. The name comes from the German verb “to cut,” since so much patient labor with the knife was necessary before the apples could be spread to dry in the sun. Apple butter they made in quantities. This is still made on most farms throughout the State. Often the kettle is swung out-of-doors. All this industry has ceased in the Moravian buildings in Bethlehem, and the yellow cottage is the headquarters of the Moravian branch of the King’s Daughters."